When I received this in my email, I could not believe it. 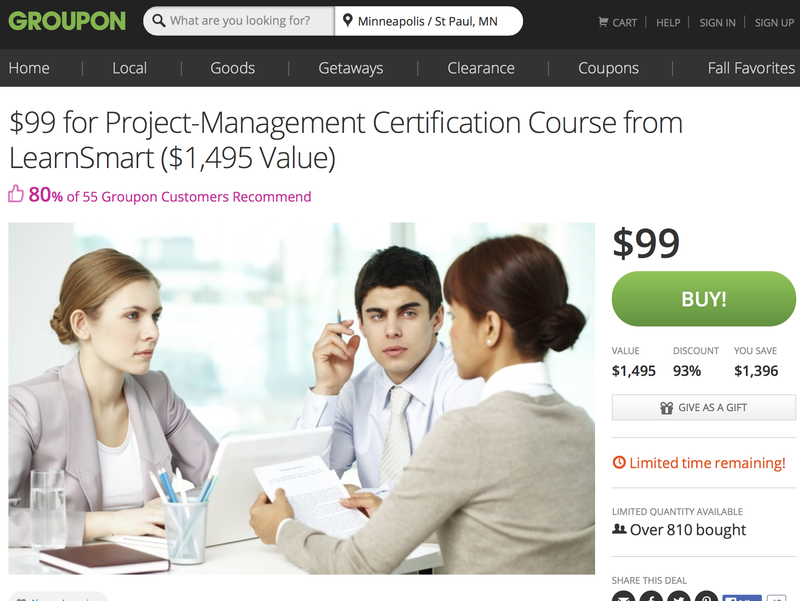 A project management course on Groupon! The first feeling that rushed through me was that of disappointment, a little sadness, even a hint of anger. How could they do this? A project management course on Groupon? This is not a pizza deal, or an apple picking orchard or a meal for two at a fancy restaurant. This is my career, my profession on Groupon. But then, I looked at the number of folks who had signed up. 810. Well, not bad. 810 folks will benefit from this amazing deal. 810 folks will learn about project management – however the quality of the instruction. 810 people may enter the profession, 810 people may see this as an option for their kids in future. 810 is a big number and then slowly I smiled. If Groupon can spread the project management discipline to more folks, that’s a great deal. Isn’t it? This entry was posted in ARTICLES and tagged future of project management, Groupon, project management deal. Bookmark the permalink.